Colombia is the most dangerous place in the world to be a trade unionist. 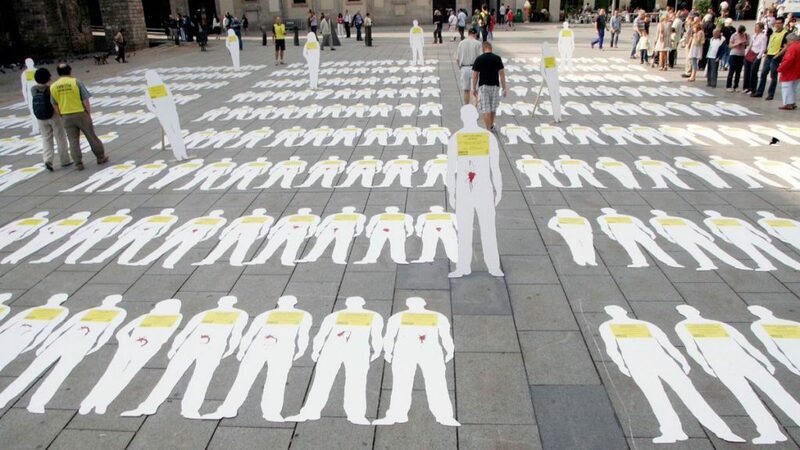 More than 3,000 have been murdered since 1989 – more than in the rest of the world combined. They are murdered with impunity. In 87% of cases of trade union murders, nobody is brought to justice. Colombian unions denounce that this impunity is a green light for assassinations to continue. Most of the killings of trade unionists are carried out by right-wing paramilitaries with documented links to the Colombian security forces. However, many have been murdered by the Colombian Army, and in the late 90s and early 2000s, the secret police were exposed for drawing up ‘death lists’ of union members. The grim toll of Colombia’s war on trade unions since 1977 amounts to at least 3,062 assassinations, 233 kidnappings, 342 violent attacks, 6,572 violent threats, 1,890 forced displacements and 725 arbitrary detentions. 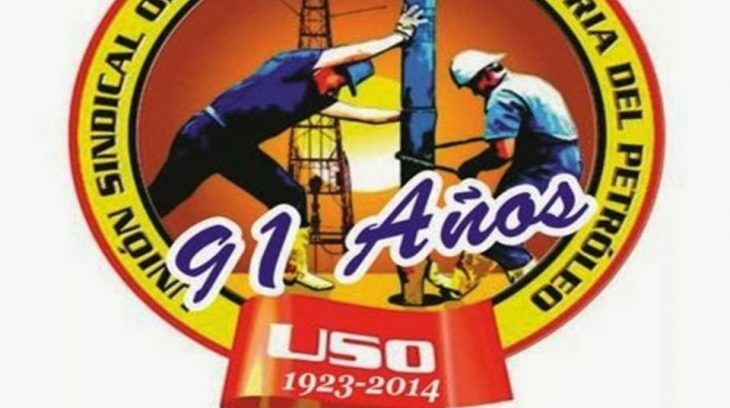 Small but active, union membership in Colombia has taken a devastating hit in recent decades. Violence, anti-trade union laws and policies, and massive labour market changes, such as widespread privatisation and a huge rise in the number of people working in informal, insecure jobs, have undermined union organisation. Until the 1990s Colombia’s unions were among the strongest in Latin America. Membership – now the lowest in the Americas – has halved in less than 20 years, leaving only 850,000 trade union members in the country, fewer than 4% of the workforce. In spite of these difficulties, the union movement continues to play an active role in Colombia: in 2013 and 2014, together with social organisations from across the country, the trade unions were involved in weeks of strikes and disruptions across Colombia in response to the devastating impact of international free trade agreements. In 2016 truck drivers went on strike for 45 days and in 2017 Colombia’s teachers reached an agreement after more than one month of strike action. The Colombian trade union movement is fragmented, with more than 2,000 registered unions and three national centres – the CUT, CTC, and CGT. CUT is by far the largest centre, with 746 affiliated unions, representing more than 600,000 members. 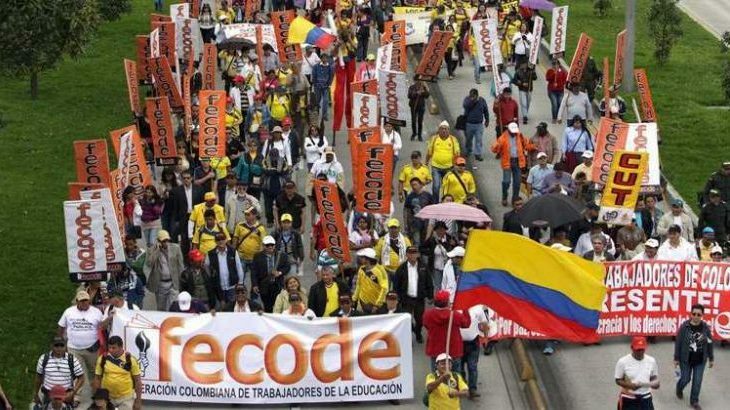 FECODE, a national federation representing around 250,000 teachers is Colombia’s largest union, followed by FENSUAGRO, representing around 100,000 peasant farmers and agricultural workers. Although Colombia has ratified 61 International Labour Organisation (ILO) conventions, Government and employers routinely undermine and sabotage workers’ rights. Less than 1% of Colombians are covered by collective bargaining agreements – a fundamental right under ILO conventions. Colombia was included on the ILO Blacklist for two decades due to continual violations, including freedom of association and the right to organise. Colombia signed a Labour Action Plan (LAP) in 2011 supposed to guarantee basic labour rights as a prerequisite to the signing of a Free Trade Agreement with the United States. But the LAP has never been fully implemented and widespread abuses continue. Over 60% – particularly women and afro-colombians – are forced to work outside the formal economy as low-paid ‘informal’ workers. Use of temporary contracts – which are excluded from the Labour Code – and ’employment cooperatives’ are common strategies to move staff into insecure employment. Of seven million Colombians in formal employment, just four million have permanent contracts. Private sector employers often use ‘collective pacts’ between individuals and employers, which offer better pay to workers in return for leaving the union.